Having people round for dinner is meant to be fun, but cooking for people at home isn’t always the most relaxing event. We plan too much, and end up spending all our time hidden away in the kitchen, not with our friends which was the point in the first place. Simple dishes and preparing in advance is obviously the key, we want to spend as little time in the kitchen as possible. When it comes to dessert I think pie is a great prepare ahead dessert, you definitely don’t want to making pastry when you should be enjoying a catch up with friends. You can make it fully in advance and either serve it at room temperature or reheat it in the oven and serve it warm with a scoop of vanilla ice cream. 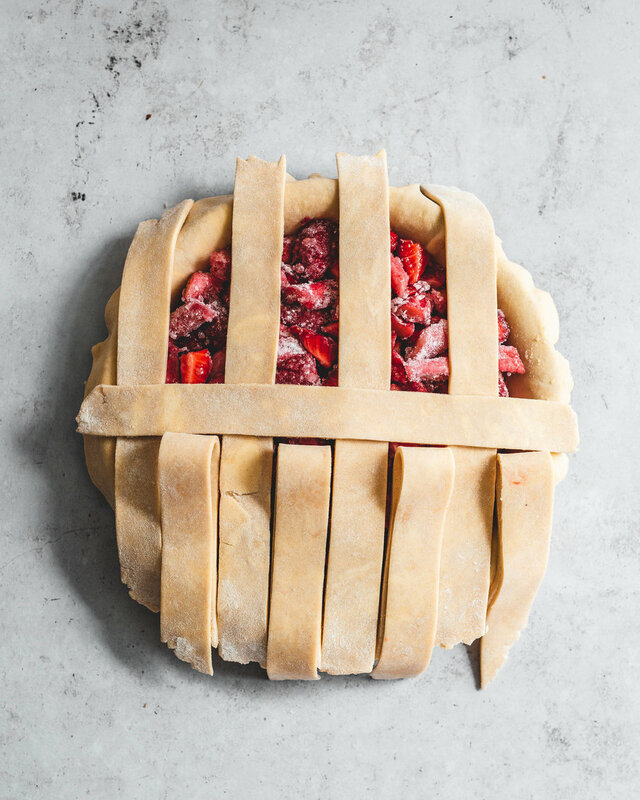 In my mind any pie is an impressive dessert but if you want to show off just a little bit why not make one with a lattice crust, its easier than it looks I promise, but its also very pretty and adds a little wow factor. Something else that is easier than it seems is protecting yourself online. I am currently working with Cyber Aware on their #OneReset campaign to show you a simple step to protect yourself online. One thing you can do is make #OneReset to your email password to make it strong and separate to the ones you use for your other online accounts. Since our email passwords are the gateway to lots of personal information and other online accounts, it is imperative to secure them with strong passwords. Hackers can use your email to access many of your personal accounts, by asking for your password to be reset, and find out personal information, such as your bank details, address or date of birth, leaving you vulnerable to identity theft or fraud. One way to create a strong password is to use three random words, and maybe throw some numbers or special characters in there too to make the password even stronger. I promise you it is even easier than making this pie! Take two minutes out of your day and make your life online more secure. To make the pie dough place the flour into a large bowl and mix together with the salt and sugar. The sugar is optional but it helps promote browning in the dough and helps it have flavour of its own so I tend to use it regardless of whether I am making a sweet or savoury pie, simply reducing the sugar a little if making a savoury pie. Add a quarter of the butter to the bowl and toss in the flour. Rub this portion of butter into the flour, as if making a crumble, until the mixture resembles fine breadcrumbs. This stage coats all the flour in fat which helps to give the dough some tenderness. Add the remaining butter and press the pieces into flat sheets of butter. Pop the bowl into the freezer for 10 minutes to firm up the butter. Mix together the water and vodka in a small bowl. Make a well in the middle of the bowl and pour in a couple tbsp of the water mixture at a time, tossing together with the flour to distribute. Continue adding the water in this manner until when you squeeze the mixture and it starts to hold together. Tip the dough mix out onto the work surface and use your hands to gently bring it together into a uniform mass. The dough should be fully moistened, no dry pockets. At this stage I do something a little unusual, something I borrowed from the bakers of Portugal, something that helps create a super flaky dough. Watching bakers in Lisbon make the dough for custard tarts, they rolled the finished dough into a sausage adding more and more layers, almost as if making puff pastry. I tried this with my pie dough and it really helps build in extra flakiness. Take the dough and roll it out into a rectangle about 3 times the original size, as you roll this out you should be able to see big streaks of butter, if you’re seeing this you’re going to get beautifully flaky pastry. Roll the dough up into a thick sausage, cut into pieces an form into discs of dough. 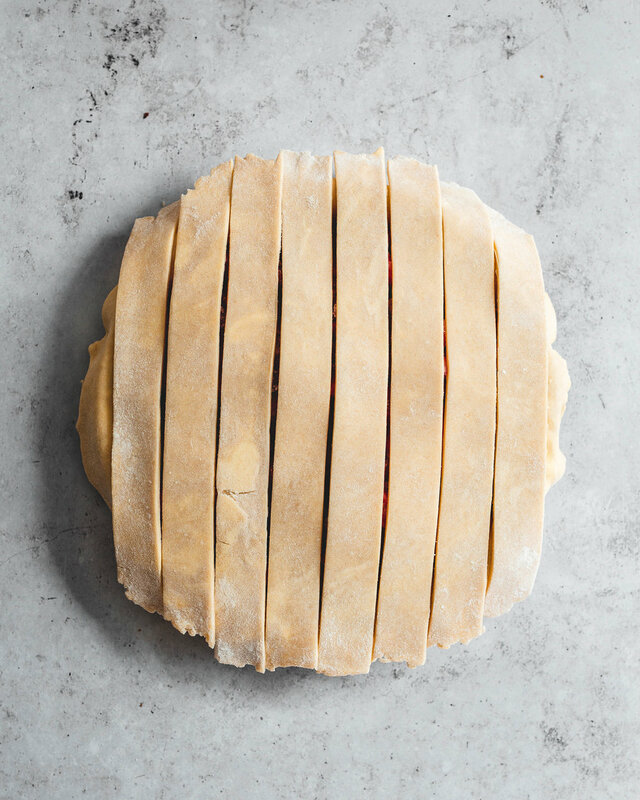 Wrap the pieces of pie dough in clingfilm and refrigerate for a couple hours before using in the pie. When ready to make your pie preheat the oven to 200C/180C fan and place a baking sheet onto the middle shelf of the oven. To make the pie place the fruits and lemon juice in a large bowl and mix together to combine. In a small bowl mix together the cornflour and sugar, this helps prevent the cornflour from forming lumps in the finished pie. Add the sugar mix to the fruit and stir to combine. Set the bowl aside for the moment whilst you work on the pastry. 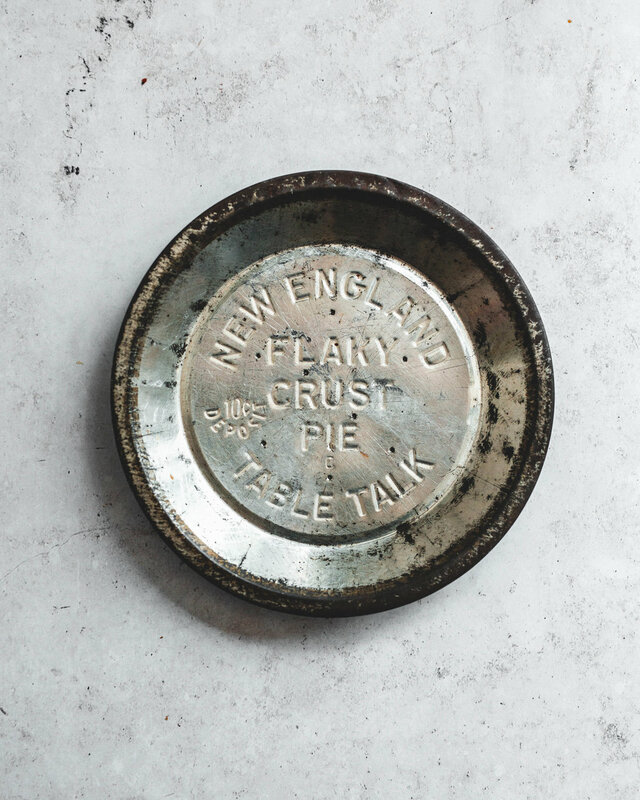 Remove one of the pieces of pie dough from the fridge and on a lightly floured work surface roll out until just a little bigger than your pie plate, I prefer a 9-inch metal pie plate. Roll the pastry up onto your rolling pin then carefully unroll it, draping it into the pie plate. Gently lift and press the pastry to make sure it is sitting flush in the corners of the pie plate. Trim the excess so about 1-2cm is hanging over the side of the pie plate. Pop the pie into the fridge for a moment, removing the second piece of dough. Roll out the dough as before, rolling a little bigger than the previous piece. Using either a pizza cutter or a large sharp knife cut the pastry into long strips, about 2.5cm wide. You can make your strips wider or thicker, it’s up to you and the style you are going for. To form the pie remove the pie plate from the fridge and scatter over a handful of ground almonds, these will soak up any excess juices as the pie bakes preventing the base from coming out soggy. Tip in the fruit filling and spread into an even layer. Place half the strips over the top of the pie, just leaving a small gap between each one. Fold alternate strips halfway back on themselves and place a new strip perpendicular over the remaining unfolded strips then fold the strips back, sitting onto top of the new strip. Repeat this weaving process until you have covered the whole pie. Trim the strips so the ends just sit on the rim of the pie plate. Roll up the overhang of the bottom crust so that sits, like a thick rope, on the rim of the pie plate and locks in the strips. Using your favourite method crimp the rope of pastry and before placing in the oven to bake brush with egg wash and liberally sprinkle with demerara sugar which will look beautiful but also give the pastry a nice crunch. Place the finished pie into the oven on the preheated baking sheet and bake for about 50-60 minutes or until the pastry is golden brown and the filling is bubbling almost like jam. If the pastry is growing too quickly, before the filling has a chance to fully cook you can tent the pie with a piece of foil. My preference is to serve the pie at room temperature so the filling has a chance to set so set aside until cooled then enjoy, served al la mode with a big scoop of vanilla ice cream, or chocolate if you really want to complete the blackforest vibe.